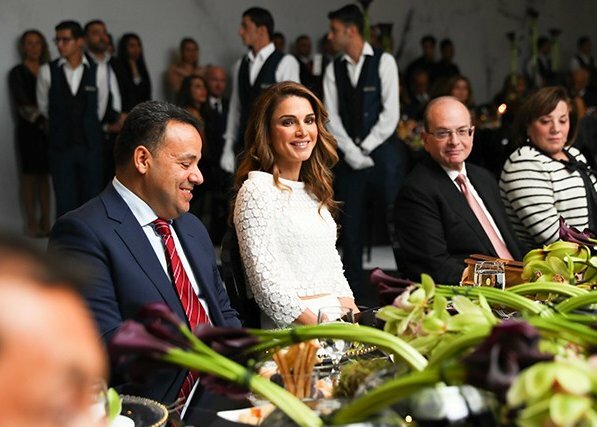 Queen Rania of Jordan attended a gala benefit dinner hosted by Jordan River Foundation (JRF) on Sunday night, to support its Child Safety Program (CSP), and raise awareness about child abuse issues at the Four Seasons Hotel Amman in Jordan. Queen Rania is JRF’s Founder and Chairperson of the Board of Directors. Now this is how you wear a crocheted top. It has a retro but well cut shape and you can see even through photos it's quality material. So different from those horrid Self Portrait pieces Kate and Mette-Marit wore. You are absolutely right with your comment. It is perfect in length, 3/4 sleeves, and I like the bandeau shift/bra she is wearing underneath, it goes so well with the neckline and the brown belt. Great! Also she kept her make up esp eye make up to the minimum going for the fresh vibe instead of the wicked eyeliner look. You are so right. I am so tired of these black eyeliners, that make the ladies usually look ten years older. Queen Rania, another beautiful and stylish lady! Gorgeous!